In patients presenting to the ED with very low risk chest pain, can a structured approach to shared decision making provide some benefit? Specifically, does it improve general comprehension and decrease resource utilization all in a safe manner? In this study, 898 patients in the USA were randomised to a shared decision making facilitated by a decision aid or to usual care. With the decision aid, 15% more patients decided not to be admitted compared to usual care (52% vs. 37%). 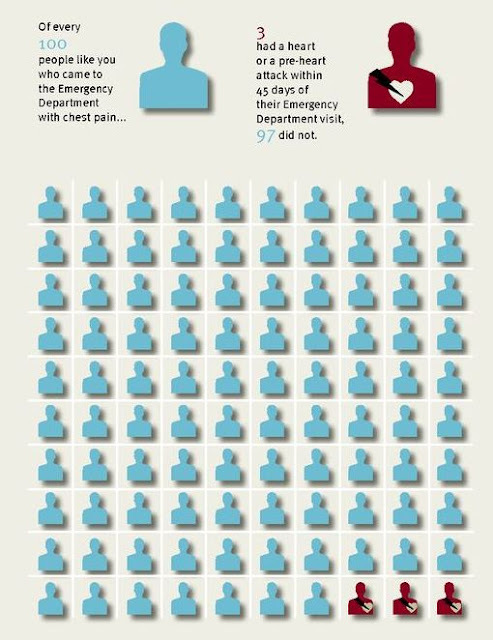 Oh… and out of 898 patients, how many cardiac events were there? This obviously begs the question as to why the vast majority of these patients could be sent home regardless of the decision aid. Nevertheless, I think it does send the message that a structured approach to shared decision making may provide a better framework to educate our patients. Hess EP,Hollander JE, Schaffer JT, et al. Shared decision making in patients with lowrisk chest pain: prospective randomized pragmatic trial. BMJ 2016;355:i6165.